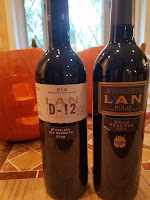 In 1972 Bodegas LAN was founded and named after the first initials of these three provinces of DOCa Rioja, but with the L representing Logroño - part of the larger La Rioja. Their estate, Viña Lanciano Vineyard, is set on 72 hectares that are nearly surrounded by a meander of the Ebro River. The river also acts as a natural frontier between Rioja Alta and Rioja Alavesa. According to DOCa Rioja, "in Rioja Alavesa there is a significant influence of the Atlantic climate and the soils are chalky-clay situated in terraces and small plots. In Rioja Alta the climate is also mainly Atlantic, while the soils are chalky-clay, ferrous-clay or alluvial. Rioja Baja has a drier, warmer climate, thanks to the Mediterranean influence and the soils are alluvial and ferrous-clay." And as their name suggests, Bodegas LAN either directly controls or sources from vineyards in each of these three regions. Sourced from various forests in central France (Allier, Tronçais, Jupille…) its characteristic aromas are soft vanilla, clove and chocolate. Coming from Ohio and Missouri, its aromas remind of cocoa and aromatic herbs. From the Caucasus and the Adyghe Republic, this type of oak has less fragrance and is more respectful to the wine. As pioneers in the use of hybrid barrels, made with American oak staves and French oak heads, their use lend our wines a unique personality. We recently received two samples to illustrate Bodegas LAN's winemaking process in time for #TempranilloDay. On Thursday November 8th celebrate with a bottle of Tempranillo and follow Twitter #BodegasLAN and #RiojainThreeLetters conversations to learn more about LAN and Rioja. Cheers. This wine is a blend of 98% Tempranillo and 2% Mazuelo hand harvested from two plots in the town of Haro (Rioja Alta) and two plots in Laguardia (Rioja Alavesa). D-12 is intended to pay homage to the workers of LAN and the name is a reference to “DEPOSIT 12”, the stainless steel tank that each vintage holds those wines that according to LAN winery personnel have the most outstanding attributes each year. The juice is fermented in stainless steel tanks at a controlled temperature of 25º C in order to maintain aromatic potential and maximize color extraction. Micro-oxygenation and maceration in contact with the lees prior to malolactic fermentation in order to balance the tannins and display a silky mouthfeel. The fermented wine is then rests twelve months in new American and French oak barrels followed by twelve months of rounding in the bottle prior to release. Even after all the oak treatment this is a juicy fruity wine with patches of black pepper and cocoa. It has a fullness that rounds the finish into a lasting statement. This wine is 90% Tempranillo and made from a selection of the best grapes coming from 30 year-old, low yielding bush vines in the Rioja Alta and 10% Mazuelo from their Viña Lanciano vineyard. The grapes were de-stemmed and fermented in stainless steel tanks at a controlled temperature of 30º C. The fermented wine was then aged 24 months in American oak and French oak barrels, followed by a minimum of 36 months in the bottle. This is one full bodied and luscious wine, commanding intense fruit with baking spices and tobacco-leather. A completely balanced and delicious wine.